[Update 04 Sept 2015] – with only the month of September remaining, FY 2015 will surpass the last 3 years, as has been the case every year since I begin tracking these. 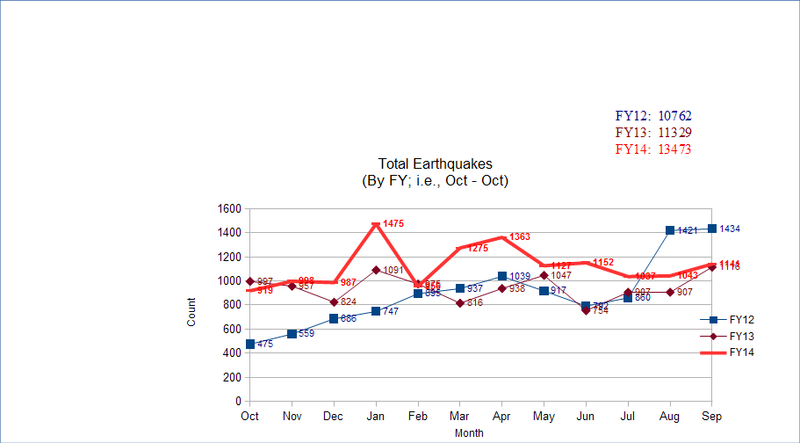 This is the first year since 2012 that every month (with only September to go) had over 1000 +2.5 magnitude earthquakes. There is something going on and we are not being told. The month of July sets a record for number of earthquakes, and is primarily due to the huge number on the west coast / Alaska, both of which I am sure you have heard very little about. As in the last 4 years, 2015 will show an increase every year in the number of earthquakes worldwide. I doubt any of you have seen this in the Mainstream Media, and the question is: Why? The USGS (United States Geological Survey) site located at http://earthquake.usgs.gov/earthquakes/ track’s all earthquakes world-wide in a near-time fashion. Beginning in October 2011, I began tracking earthquake activity because the type of reporting I wanted they did not make easily available. I will update this post monthly as the data is received. This entry was posted in earthquakes, Fukushima, natural phenomena, Nuclear Power, Radiation, Tsunami. Bookmark the permalink. I’ve read this publish and if I could I wish to recommend you some interesting issues or advice. Hi! I’ve been following your blog for a long time now and finally got the bravery to go ahead and give you a shout out from Kingwood Tx! Its such as you learn my mind! You appear to know a lot approximately this, such as you wrote the e book in it or something. I think that you could do with some percent to force the message home a bit, however other than that, that is wonderful blog. I just couldn’t go away your site before suggesting that I extremely loved the standard information an individual supply in your visitors? Rise of Earthquake Activity Worldwide | It Was Only A Dream. some of the remarks come across like written by brain dead visitors? across the web. Disgrace on Google for now not positioning this post higher! Google, and located that it’s really informative. I am going to watch out for brussels.